An international research team has discovered new DNA evidence to overturn conventional theories that suggest that the present-day populations of Island Southeast Asia (covering the Philippines, Indonesia and Malaysian Borneo) came from Taiwan 4,000 years ago. The researchers show that population dispersals came earlier, from within the region, and probably resulted from flooding. So Bellwood might have been wrong… The Out-of-Taiwan hypothesis is such an important part of my Archaeology classes in Uni that we have almost swallowed it. I wonder what Bellwood’s reaction is regarding this particular study. Does he have a rebuttal? An archaeological team has dug up a pot shard with an inscription around its shoulder, at the San Ignacio archeological site in Intramuros, Philippines, which shows an ancient form of writing. This is a really cool finding. Evidence of ancient script is very rare in the Philippines. This makes the sherd (edited; shard? what was I thinking? It’s a sherd!!!) an important artifact. Archaeologists have found three Inca child mummies dating back to 500yrs on the top of the 22,000ft summit of the Mount Llullaillco volcano in Argentina. One of the mummies found is that of a thirteen year old girl, now dubbed as the ‘Llullaillaco Maiden’, the other two mummies are that of a boy and a girl aged around four years old. The mummy of Llullaillaco Maiden is remarkably preserved whereas the remains of the boy and the girl were struck by lightning and so are charred. Sacrifices are very significant rituals in a lot of cultures around the world. (Note: I just want to give a sneak peak about something similar in the Philippines) In the Philippines, sacrifices of chickens, bulls or pigs are done as proxy for an actual human sacrifice. This is done to appease gods or spirits, to ensure good yield of crops, among others. I remember my Anthropology prof who told us a story about one of his informants. Seeing Manila, he made a comment that the reason why a lot of children die in Metro Manila is because no proper sacrifice and ritual was done for the construction of buildings and infrastructure. The mystery potsherds sat in storage until 2011, when Mélanie Roffet-Salque pulled them out and analysed fatty residues preserved in the clay. Roffet-Salque, a geochemist at the University of Bristol, UK, found signatures of abundant milk fats — evidence that the early farmers had used the pottery as sieves to separate fatty milk solids from liquid whey. That makes the Polish relics the oldest known evidence of cheese-making in the world1. Here’s an article about how the consumption of milk evolved in Europe. It also answers how Europeans overcame lactose intolerance through the lactase gene, while other populations in the world did not. I’ve posted something about Bellwood’s hypothesis on the peopling of Southeast Asia and Oceania somewhere in this blog. And I believe that when one discusses Bellwood, s/he is also obliged to discuss Wilhelm Solheim’s hypothesis. The Nusantao Maritime Trading and Communication Network is something that Solheim has been thinking through since the 1960s – aside from his Sa-Huynh Kalanay complex. First off – what the heck does Nusantao mean? It was derived by the linguist George Grace from the root words “Nusa” which means “South” and “Tau” which means “Human”. We can see in the etymology itself how it differs from Bellwood’s hypothesis. Solheim suggests a South-to-North dispersal of the Austronesian-speaking peoples starting from Sarawak and Southern Mindanao. The most striking part about Solheim’s thoughts is his emphasis on the cultural aspect of the peoples of Southeast Asia, East Asia and Oceania – yet again another alternative to Bellwood’s thinking who puts more emphasis on the biological origin of the peoples in the area. Solheim stresses that the spread of language and culture in the aforementioned areas was not a product of migration but a product of years of trading – the Nusantao Maritime Trading and Communication Network. Beyond Bellwood’s given date of the spread of the Austronesian-speaking peoples, Solheim suggests that there had been massive maritime network in parts of the areas as far back as 30,000 BC. This is evident through the commonalities in culture in Southeast Asia’s Hoabinhian, Korea’s Early Neolithic and Japan’s Early Jomon, Jomon and Yayoi period (up to Eastern Honshu). Some linguists even say that there are certain Japanese words – mostly related to farming – that might have originated from Southeast Asia. A species of rice – Javanica – which originated in Sarawak, is also present in parts of Japan. Moreover, Japonica, the rice species that they have in the Mainland China (where Bellwood thinks the proto-Austronesians originated before moving on to Taiwan) is not archaeologically present in Insular Southeast Asia. 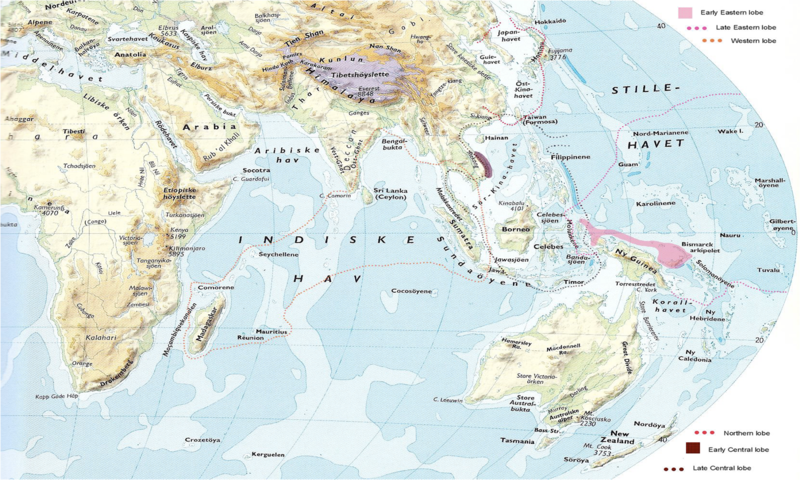 The Nusantao Maritime Trading and Communication Network started, as Solheim thought, in 5000 B.C. He suggested four lobes dividing parts of East Asia, Southeast Asia and Oceania – the Eastern Lobe, the Central Lobe, The Northern Lobe and the Southern Lobe. All of these lobes’ point of origin is the Central Lobe. The NMTCN (Nusantao Maritime Trading and Communication) isn’t ripe yet, in my opinion. Indeed, most people will adhere to Bellwood’s claims as it has a more biological approach. However, I see many points and potentials in Solheim’s thinking – though it is still very early to say which one among them is right or if really anyone is indeed exclusively right. Bellwood has his points and Solheim has his. In my view, we need more data. Excavations in the Philippines and much of Southeast Asia and Oceania are not yet sufficient to give a clear picture. Much of Mindanao – which is archaeologically crucial, in my opinion – has been left out in framing hypotheses (though Solheim looked into it more than Bellwood did, the latter concentrating more on Northern Philippines and no attention whatsoever in the South). In the end, both of them might be right. They just might be two sides of the same coin. There might be clashes in their hypotheses, but there’s also a way to fit them in – if fit them in is what we should do. Flessen, C. 2006. Bellwood and Solheim: Models of Neolithic movements of people in Southeast Asia and the Pacific. Available:https://files.itslearning.com/data/ntnu/44801/bellwood-solheim.pdf[Accessed: 11/26/2009]. Solheim, W. 1996.Nusantao and the North-South Dispersals. Indo-Pacific Prehistory Association Bulletin, 2: 101-109. Solheim, W. 2006. Archaeology and Culture in Southeast Asia: Unraveling the Nusantao. Quezon City: University of the Philippines Press. To supplement the essay I wrote a while back, here’s a very informative video about Austronesia and how Austronesian-speaking cultures are related to each other. The main model taught today in schools (as well as more than a decade ago when I was still in elementary) on constructing the origin of the Filipinos is Beyer’s Wave Migration Theory. H. Otley Beyer is one of the “big boss” in Philippine Anthropology. In fact, he taught the first Anthropology class in the Philippines and established the first Anthropology Department in University of the Philippines Diliman. You can say that he is well-respected and he did a lot of contributions to Philippine Archaeology. (Oh and he was the mentor of one of the best Filipino anthropologists, F. Landa Jocano).However, his wave-migration theory is considered outdated among the community of scholars. It’s primarily because he had no specific and tangible data to back up his theory.There are currently two opposing studies on the peopling of Southeast Asia — which of course, includes the Philippines. The Out-of-Taiwan theory of Peter Bellwood and Robert Blust, and the Nusantao Maritime Trading and Communication Network by Wilhelm Solheim II. What I’m gonna discuss here (briefly) is the Out-of-Taiwan theory.In Peter Bellwood’s “The Origins and Dispersals of Agricultural Communities in Southeast Asia” , he says that individual islands from Southeast Asia did not develop agriculture within their boundaries. However, the dispersal of agriculture coincides with the migration of the Austronesians from Taiwan 5,000 years ago to the Philippines and Indonesia, then to the west reaching as far as Madagascar and then to the east populating much of Oceania. Peter Bellwood drew theories and data on Archaeology, Comparative Ethnography, Genetics and Linguistics – specifically from Robert Blust‘s model of the dispersal of the Austronesian language. Taiwan, being the host of Austronesian language-diversity could’ve been the origin, as linguists would argue. Austronesian languages also have a lot of similarities that when reconstructed would trace back to Taiwan. Peter Bellwood also has evidenced of carbon dating of materials used by the Austronesians — pottery, adzes, spindle whorl, etc. — and it shows that there is indeed an emerging pattern. The oldest ones are from Taiwan, next is in the Philippines and Indonesia, and the youngest ones are in Oceania. And also evidently, there are close similarities in the cultures of people from Madagascar in the west to Easter Island in the east. There are however problems with using genetic evidences since there had been mixes among the Southern Mongoloid Austronesian speaking people and the Australo-Melanesians, which had inhabited some islands such as Philippines but never really conquered vast areas or islands. Now all that remains is the question, why? Why did the Austronesians migrated and conquered a vast area. Peter Bellwood also answers this question. Bellwood says that there is demographic advantage in maritime traveling among Austronesians as they were near a chain of islands. Hence, they were able to enhance and develop their maritime skills. Their agricultural skills also gave them an advantage in conquering other islands, since they could practically live anywhere. Being able to cultivate means that they would have stable supply of food once they move to another island. Also, there is a prestige factor in colonizing a different land. He called it the “founder-focused ideology”. However, the main thing – according to Bellwood – that pushed the migration of the Austronesians could have been the rising population densities of agriculturalists from China (the pre-Austronesians were said to be from Southern China) pushing these Austronesians to get in their boats and move out. But of course, this “moving out” isn’t like the exodus from Egypt. There might’ve been separate sailings from groups followed by another and another. Later on, there might’ve been also backward routes. Bellwood says that the dispersal of the Austronesians is one of the most amazing feats in the world as they covered half of the world. In fact, Austronesian languages have the most number of speakers. However, as was said, the Out-of-Taiwan theory is still not accepted by all scholars. Wilhelm Solheim proposes a different theory — which I’ll try to discuss later. Enthralogy | captivate. fascinate. enchant. Snarky with a side of awkward. A blog about anthropology, ecology, and evolution. Updates Thursday and Sunday.